SudoCue offers you a Sudoku Special puzzle. Each time a different variant will be featured. If you like to see more of this variant, use the contact form to tell me. With enough support, each of these variants can be turned into a weekly or daily feature. We were all shocked by a total forum blackout today. Ten years from now, addicts will still remember this day and ask each other: “Where were you when the forum went down on sudocue.net?”. They may even write a song about the event. The following Taiken will make sure we never forget! 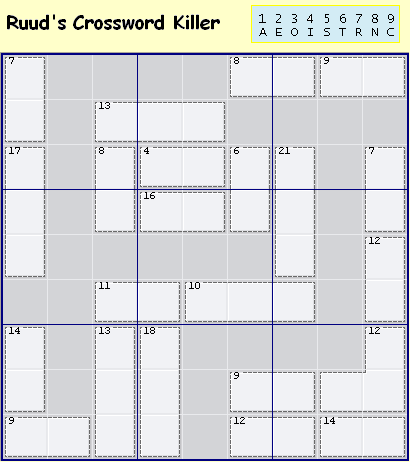 You need some creative moves to solve this puzzle, but it does not require any trial & error. Erm ... where do I write pencilmarks? Each April 30, here in Holland we celebrate an ancient tradition: Queens’s Day. Sort of Independance Day without the “in” part. That day, the Queen and her family go visit and pretend to like their subjects who pretend to like them back. Orange is the color of choice on Queen’s Day. The following puzzle is dedicated to our beloved Queen. It is Big, Orange and Clueless. 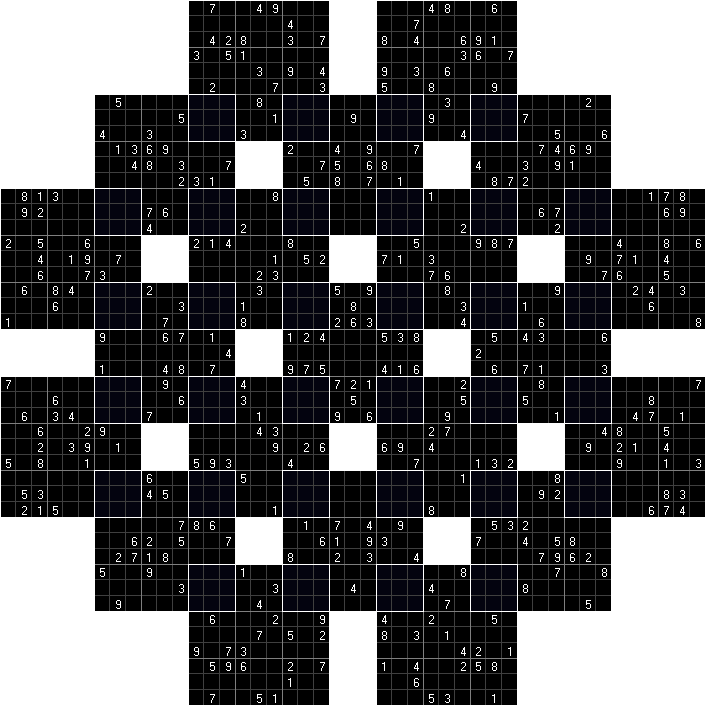 All constituent Sudokus, including the 22nd Clueless Sudoku in the blue cells, require digits 1 through 9 in both diagonals. The Easter Bunnies hid a couple of X in this Easter Special. A Killer that needs some research done before you can even attempt to solve it. Warning: No compilations were used in the creation of this puzzle. This puzzle has several X-Wings that you may need to complete it. This is a monster that you will only find on this website, because nobody else has the guts to make such puzzles. Here is my fourth Killer-X. There are 5 cages with diagonal connections, which completely cover both diagonals. Not an easy Killer. To play this puzzle using SumoCue, download and open this file. Here is my third Killer-X. A combination of Killer and regular Sudoku techniques is required, unless you manage to find a shortcut that I have missed. As usual, the forum welcomes your walkthrough. Last week I've been perfecting my new program called GattaiMaker. 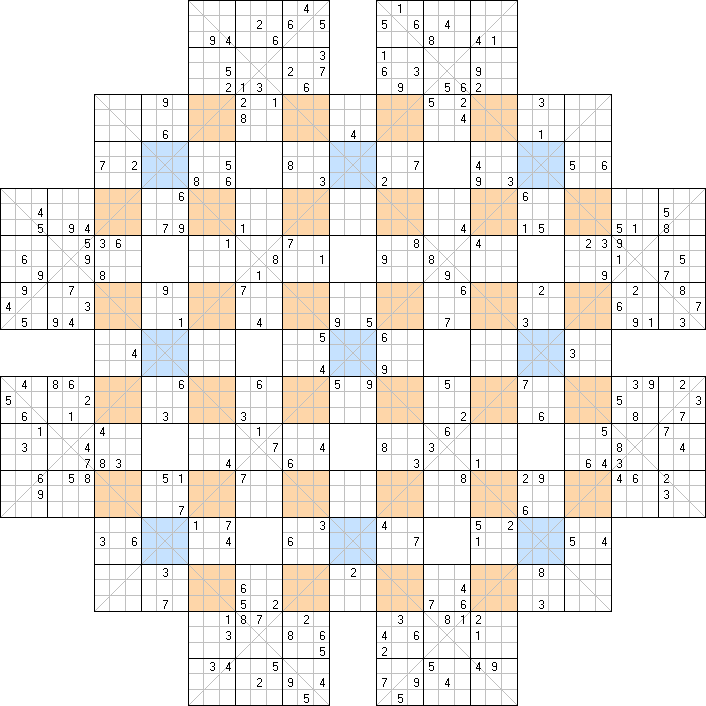 I've already posted several large overlapping puzzles in different Sudoku forums, but the program allows me to build very complex puzzles, far beyond the ones you have seen so far. The Windmill is only a minor variant compared to this Clueless Sumo. This puzzle is a Sumo combined with a Clueless. 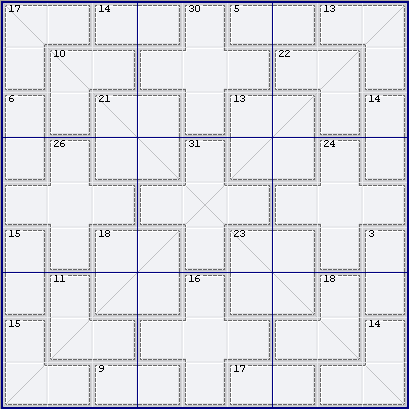 There are 13 overlapping Sudokus in Sumo formation. The overlapping boxes are clueless. 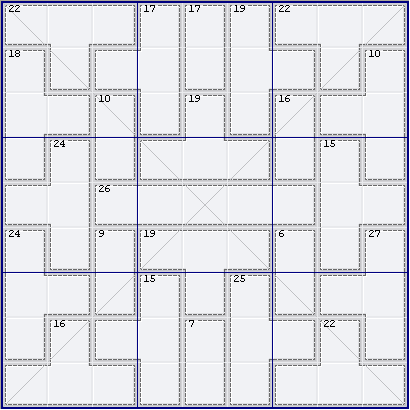 There is a 14th Sudoku formed by the blue cells. This Sudoku is also completely clueless. The resulting puzzle has 25 empty boxes. It can be solved with basic techniques: singles, locked candidates and subsets. 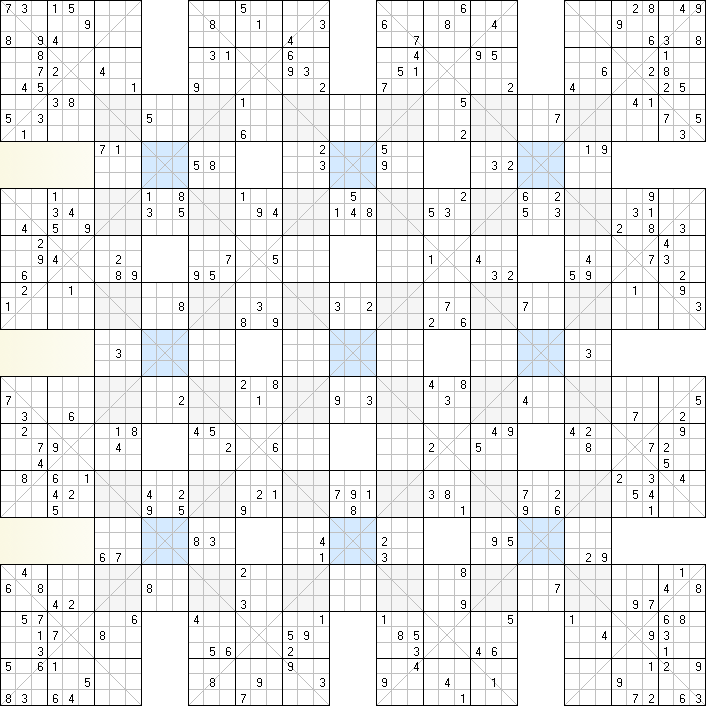 Now that the Samurai contest is going, I am honored to introduce to you a new type of overlapping puzzle. 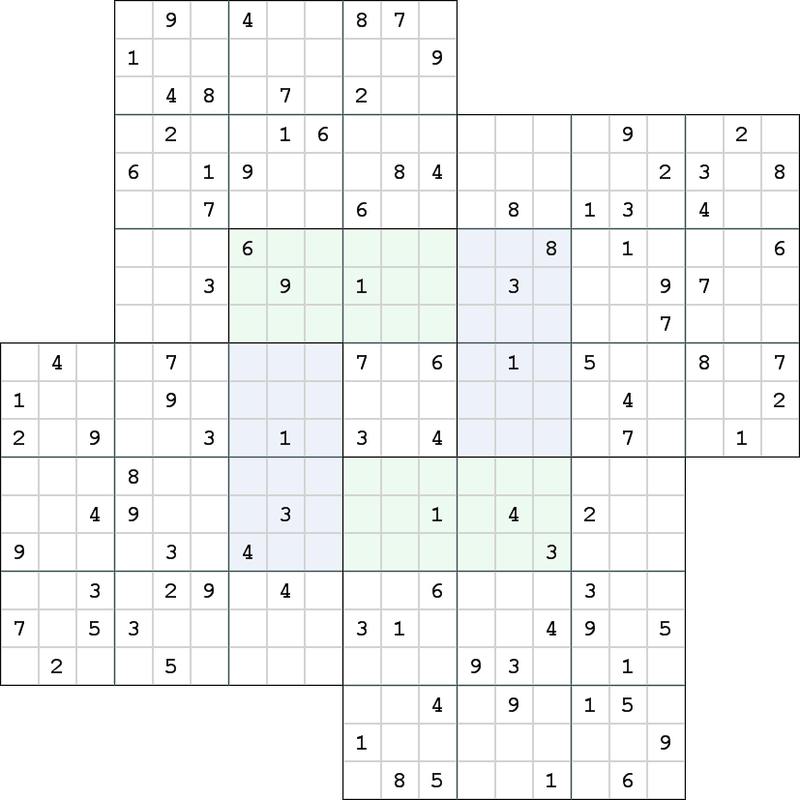 This puzzle has 5 overlapping sudokus, like a Samurai, but the overlap is 2 boxes in stead of one. Because the shape reminded me of a windmill, and because I live in Holland, I named this variant Kazaguruma, the Japanese word for windmill. This puzzle can be solved with relatively easy techniques, but you can also use the twin nonets technique to speed things up. You know what to do with those numbers below the puzzle. An interesting variant. The blue cells must also contain digits 1 through 9. This variant has been introduced by Peter Sudoku. Brace yourself before you attempt to solve this Asterisk. It requires some unusual solving steps using the extra constraint. 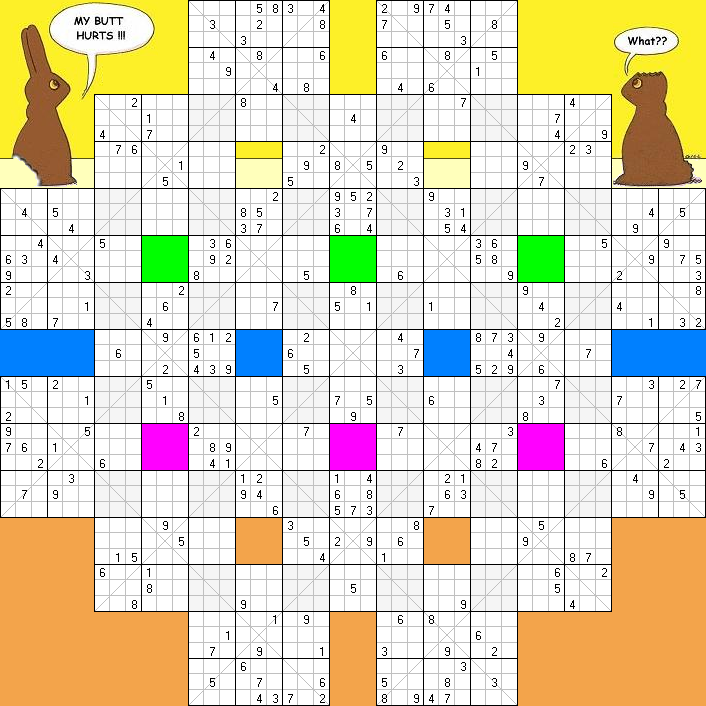 I have changed the program that I use to make Clueless puzzles. 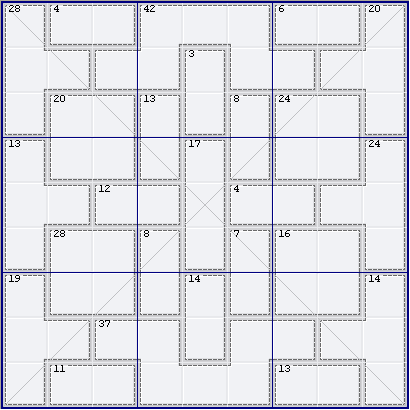 It can now also make Samurai puzzles. Here is the first result. Update: You can now join the Samurai Contest. Use this puzzle for training. 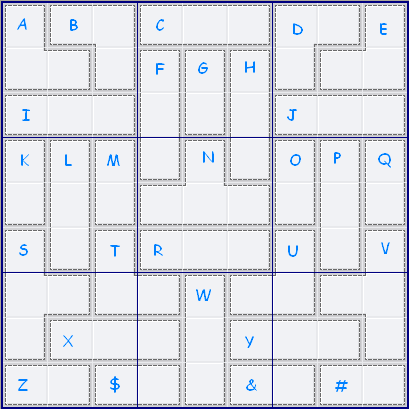 Here is a new type of puzzle, inspired by a post on the Sudoku Programmers forum. The following line represents a Sudoku. The digits are the given numbers and the letters A, B, C and D replace the empty cells. Each letter represents a decompression instruction like “insert 2 empty cells”. The letters have no specific order. That would be too easy. However, to help you on your way, I will give you a hint: The given numbers form a symmetrical pattern. Thanks to ocean who discovered an error in this string, but found the solution anyway. The error has been fixed. 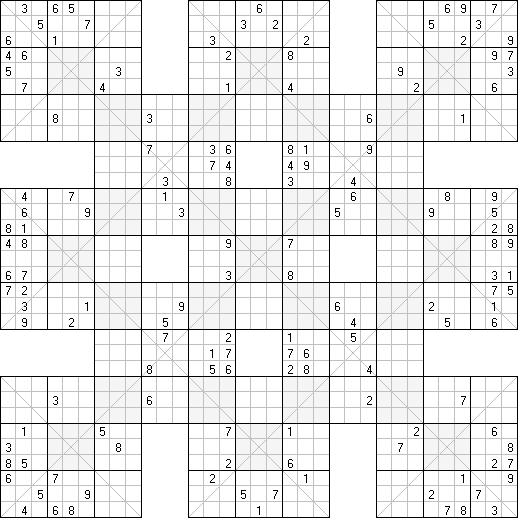 Here is the decompressed Sudoku. The codes were: A=2 empty cells, B=remainder of row empty, C=1 empty cell, D=4 empty cells. Here is my second Killer-X. SumoCue cannot help you solve this killer completely, but I have verified that a solution can be found with a combination of Killer and regular Sudoku techniques. Please post your walkthroughs on the forum. Many people have solved this puzzle by now, thanks to a big hint by Motris. He happens to be a chemist. This is a little one-off gimmick. To figure out the clues, you need to find a way to convert the letters into numbers. People who enjoyed my Celebrity Killer may think this is similar, but not so. Use the forum if you want to share your insights with fellow addicts. 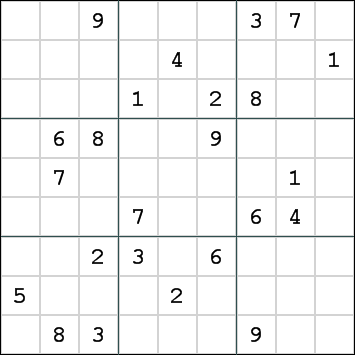 Once you know how to convert the letters into numbers, the Sudoku can be solved with moderate techniques. If nobody has found an answer in a week, I will post a small hint. Good luck with this one! I have a new program that can generate a very interesting variant of Sudoku. It is not new, but I’ve given it a new name. Complete the puzzle in such a way that each row, each column and each 3x3 box contains digits 1 through 9. Sounds familiar? 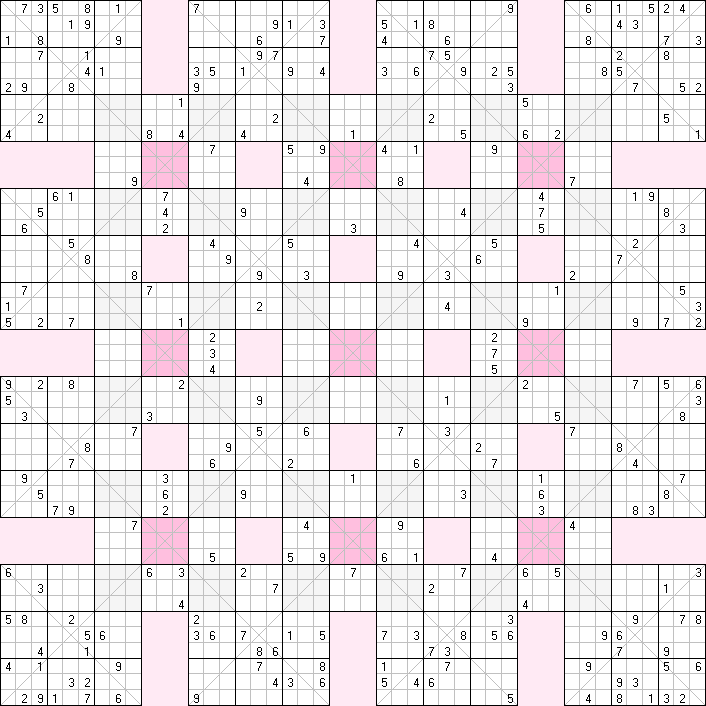 In a Sukaku, there are no digits placed in the grid. Instead I will give you a grid with possibilities. 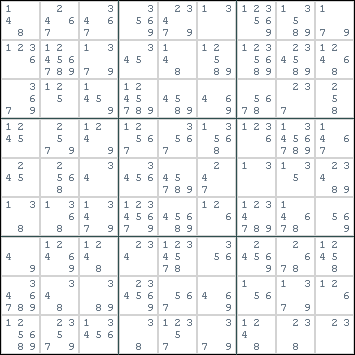 Because there are no given numbers, the puzzle can be more difficult than the hardest Sudoku you've ever seen. This puzzle is not too difficult. I found some real baddies, which cannot be solved by some of the best solvers, which I will publish at a later date. The solution is below the puzzle in tiny text. If you want to use SudoCue to help you solve this puzzle, you need version 2.0.0.5 or higher. Earlier versions cannot handle grids without any clues. The following grid can be copied to the clipboard. You can then paste it into SudoCue. The new Special is a Killer-X with a dazzling cage pattern. The are no single innies or outies. There are no pairs of innies or outies. There are plenty of triple innies and outies. 3 is the magic number. Do not forget the diagonals. They may help. Dear diary. 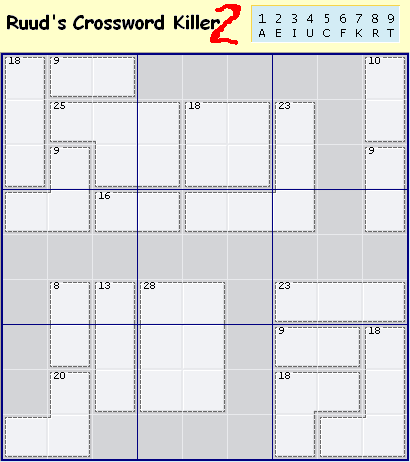 I have created a second Crossword Killer. No need to explain the rules again to those poor addicts. The 9 letter word should not be too difficult to guess, but if they cannot find it, they’d better not attempt to solve the puzzle. Although the set of letters were tempting me, I resisted using unseemly words in the puzzle. The variant is a Crossword Killer. 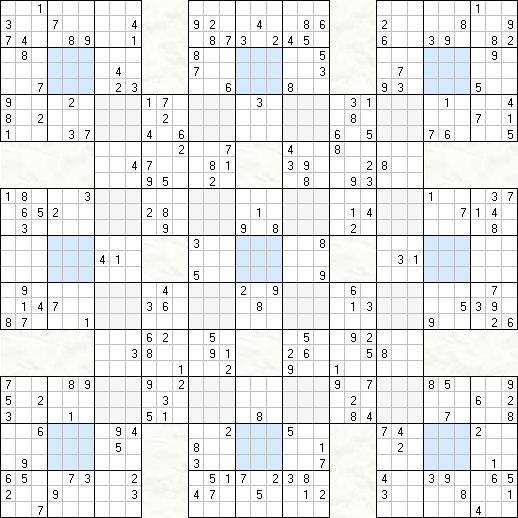 This puzzle is a mix of Killer Sudoku and Word Finder. Only a part of the 9x9 grid is covered with cages. The numbers in these cages must add up to the given sum. The cells which are not covered by cages must contain valid English words. For instance, there is a horizontal word of 4 letters in row 1, sharing the first letter with a vertical word of 8 letters in column 2. The normal Sudoku rules also apply, where you must use the number assigned to each letter. Without the Killer part, you cannot find the words. Without the words, you cannot solve the Killer part. 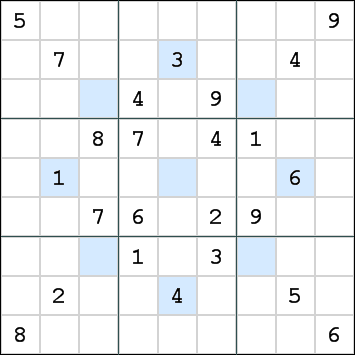 The interaction between these 2 parts makes it one of the most challenging Sudoku variants. 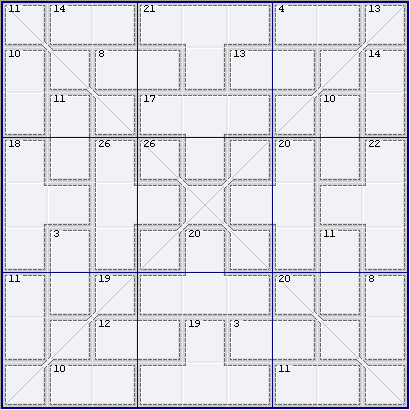 The variant for September 8, 2006 is a 12x12 Sudoku with Disjoint Groups. The given numbers have horizontal and vertical symmetry, which fits nicely with this format. You need more than just singles to solve it. The Disjoint Groups constraint may not be familiar to you. Every cell that has the same relative position in each 3x4 box must contain a different number. 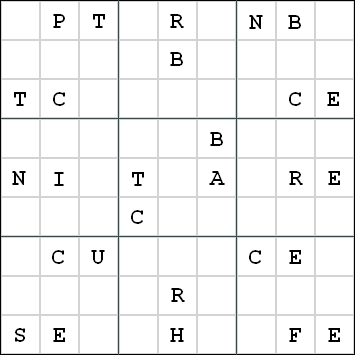 This extra constraint helps you solve the puzzle, but it is very hard to check, certainly in such a large puzzle.